Protecting over 5,000 hectares of crucial habitat in the Murray Darling region, Yookamurra Wildlife Sanctuary is a stronghold for Australia’s threatened species. It contains stands of old growth and unburnt mallee, and is the site of several successful reintroductions of some of Australia’s most endangered mammals. Yookamurra Wildlife Sanctuary protects over 5,000 hectares in the Murraylands of South Australia, between the Barossa Valley and the Murray River. The property protects some of the best stands of old growth Mallee still intact in south-eastern Australia, with trees that are hundreds of years old. Yookamurra is a stronghold for many species that are disappearing rapidly across Australia, including Southern Hairy-nosed Wombat and Malleefowl. There is a feral-proof fence around 1,100 hectares of the property, providing refuge for wild populations of several threatened species. Nestled between the eastern slopes of the Mt Lofty Ranges and the great Murray River, Yookamurra has gently undulating country, with elevation ranging from 80 to 90 m. It is in the semi-arid zone of South Australia, receiving an average annual rainfall of 270 mm, mostly between May and August. The temperature varies greatly, with very hot summers (50°C is the maximum recorded) and cold winters (-8°C is the minimum recorded). Soils on the property are generally thin, and sit on top of calcrete and rubbly limestone. They vary from sandy loam to limestone rubble, with some deep residual claypans with soils up to 3.5 m deep. Three major habitat types dominate Yookamurra: Eucalyptus shrubland (mallee); Sugarwood shrubland; and open chenopod shrubland. There are also some stands of native pine (Callitris) on the property. The most important feature of the habitat on Yookamurra is the large area of very old growth mallee, with many trees dated over 600 years old. These majestic old trees are a stunning reminder of the age of the landscape, and reveal what the bush was like several hundred years ago, before the extensive loss of habitat across southern Australia and the arrival of feral animals. There is also a large proportion of long unburnt habitat which is ideal for species such as the Malleefowl and Numbat. Located only two hours from Adelaide, Yookamurra is uniquely positioned to involve the public in conservation through its school education, research and volunteer programs. Yookamurra offers activities and overnight camps for schools and universities which focus on teaching students about conservation and AWC’s scientific approach to protecting Australia’s wildlife. Within its 1,100 hectare feral-free area, Yookamurra protects vitally important wild populations of four threatened mammals: the Bilby, Numbat, Burrowing Bettong (Boodie) and Brush-tailed Bettong (Woylie). Populations of Numbats, Brush-tailed Bettongs and Bilbies have declined significantly over the last 10 – 15 years, and the Burrowing Bettong is extinct on mainland Australia except in large fenced areas. All four species are secure at Yookamurra. Yookamurra also protects populations of Southern Hairy-nosed Wombats, as well as small mammals such as the Western Pygmy Possum, Common and Fat-tailed Dunnarts. There are over 110 bird species confirmed on the property, including the Malleefowl and rare or declining woodland birds like the Hooded Robin, Gilbert’s Whistler, Brown Treecreeper and Elegant Parrot. 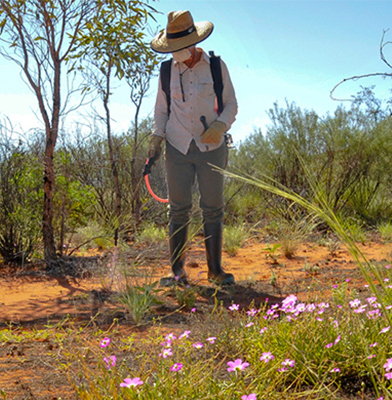 Maintaining the feral-free area, one of the oldest in Australia. The exclosure is surrounded by a special purpose feral-proof fence, and gives Yookamurra extremely high conservation value. The integrity of the fence is maintained by regular monitoring, including the use of camera traps. Protecting four of Australia’s most endangered mammals that were reintroduced within the feral-free area – the Numbat, the Bilby, the Burrowing Bettong and the Brush-tailed Bettong. The populations of all four mammal species are stable or increasing. The Bush Stone Curlew was also reintroduced to the area in 2013. Feral animal control. The 1,100 hectare feral-free area has been cleared of all feral herbivores, cats and foxes. Outside the feral-free area, AWC field staff control foxes by baiting and shooting. 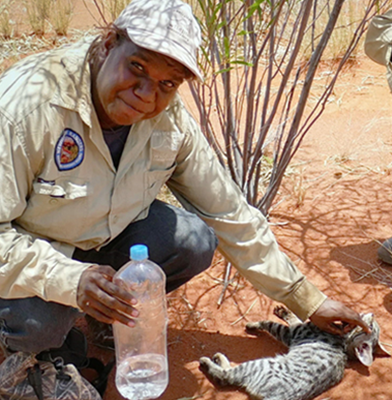 Cats are shot opportunistically when possible, and AWC is conducting research across our network of sanctuaries to develop effective landscape-scale feral cat control methods. Outside the fence there are also rabbits, which are controlled through baiting and shooting, and goats, which are controlled by trapping and shooting. Delivering fire and weed control across the property, including important habitat for the Southern Hairy-nosed Wombat. 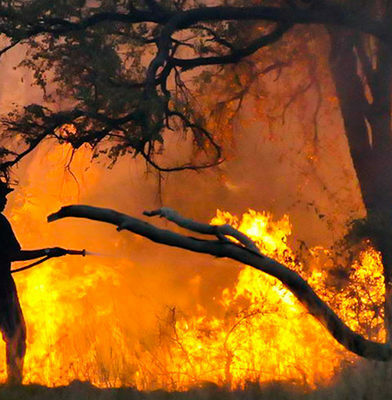 While bushfires are rare in the mallee habitat at Yookamurra, late summer bushfires have the potential to spread quickly and devastate mallee environments. Management focuses on preventing late summer fires and protecting assets, as well as some prescribed burning to reduce fuel and manage weeds. Weeds are also controlled through chemical treatment and physical removal. Implementing a unique science and conservation education program for schools and universities. We average around 500 visitors per year, and offer education and activities on threatened species and scientific methods of conservation, delivered by AWC staff. All proceeds from the school education program are dedicated to conservation of wildlife. Ecological health surveys and research. Rigorous scientific data informs all of AWC’s land management strategies, and we regularly measure the ecological health of our sanctuaries. Each year at Yookamurra our staff undertake over 2,000 live trap nights, 400 spotlight surveys, 300 camera trap nights as well as bird surveys and vegetation surveys. 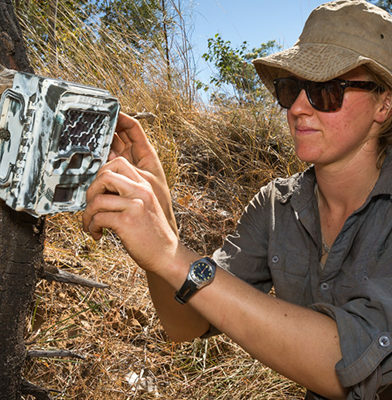 This effort is to measure a suite of ecological health indicators such as the abundance of highly threatened mammals, the diversity and abundance of key faunal groups (such as small mammals and ground-dwelling reptiles), and the significance of threats such as fire, feral animals and weeds. There are also research projects at Yookamurra associated with the reintroduction of threatened species. A small nocturnal marsupial, the Woylie is considered an important ‘ecosystem engineer’. Burrowing Bettongs (or often referred to as Boodies in western and southern Australia), are a small, thick-set, kangaroo-like animal. Feral cats and foxes occur at high densities across the Murray Darling region and (along with habitat loss) have caused widespread declines in Australia’s mammal populations. Many small mammals are regionally extinct, and their ranges have contracted significantly. There is currently no landscape-scale solution to feral predators, but AWC is conducting research into feral cat control methods across our network of sanctuaries. Feral-proof fences, although not a long-term solution, have proven effective in bolstering populations of some of Australia’s most endangered species, and safeguarding them against extinction.